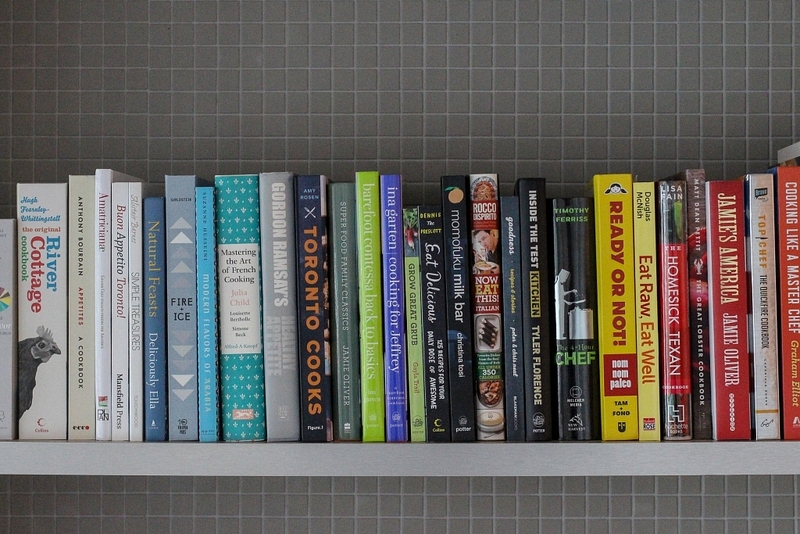 As a food blogger, I have purchased and been gifted many wonderful books over the years. Here is a list of my favourite cookbooks and books about food, currently on my kitchen bookshelf. 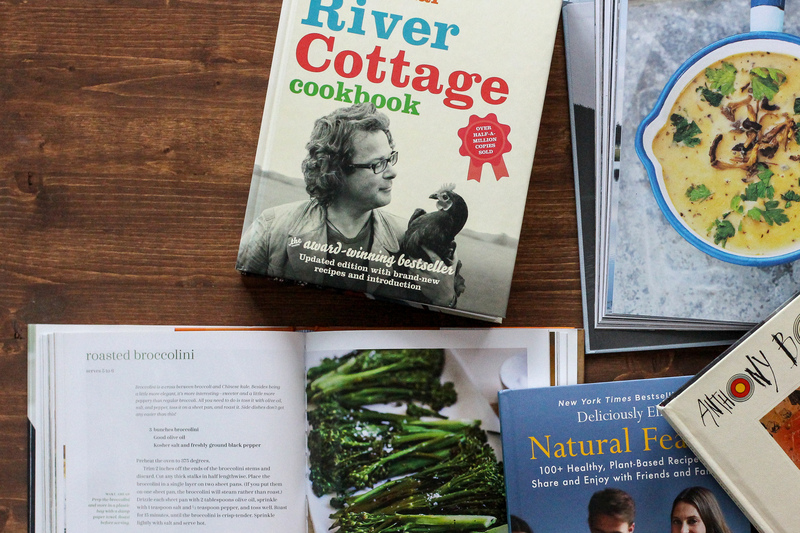 The Original River Cottage Cookbook, by Hugh Fearnley-Whittingstall: Whether or not you have watched the show River Cottage, you will truly appreciate Hugh’s adventures into the English countryside and homesteading life, along with many delicious, wholesome recipes that he developed along the way. Mastering the Art of French Cooking (Volume 1), by Julia Child, Louisette Bertholle and Simone Beck: This is a bible of French cooking for North Americans, and I have learned so much from it. Some of the techniques are a little unnecessary with modern tools, but it feels amazing to cook from this book and feel connected to Julia Child’s French Kitchen. Ready or Not: 150+ Make-Ahead, Make-Over, and Make-Now Recipes by Nom Nom Paleo, by Michelle Tam: Even if you’re not paleo or Whole30 obsessed, this is a well-organized and intuitive book for anyone wanting to eat better with or without a large family. Anyone who owns an Instant Pot should buy this book. Fire and Ice: Classic Nordic Cooking, by Darra Goldstein: Ever since my visit to Norway, I’ve been romanticizing about owning a little cabin in the woods and making tiny pancakes with smoked salmon all day. This book was a gift from my Finnish friend Kristina, and helps us both keep living the Scandinavian life in Toronto. Inside the Test Kitchen: 120 New Recipes, Perfected, by Tyler Florence: When I met Tyler back in 2014, I discovered just how creative this entrepreneurial Food Network star chef was in real life, and this “notebook” of recipes really shows it off. The recipes are simple and fun, and makes you think outside the box. Cooking for Jeffrey: A Barefoot Contessa Cookbook, by Ina Garten: I honestly don’t know where I would be without her easy, perfect-for-a-dinner-party recipes. This was a gift from my friend Eric, who has a copy himself and makes a lot of the recipes regularly. Appetites: A Cookbook, by Anthony Bourdain: If there was anything he held back on in his previous cookbooks, he certainly didn’t here. It’s exactly what you’d expect it to be and satisfyingly-so. Natural Feasts, by Ella Mills (Deliciously Ella): This blogger-turned-author-turned-health-food-mogul makes plant-based eating look effortless and chic and has the recipes to go with it. Toronto Cooks: 100 Signature Recipes from the City’s Best Restaurants, by Amy Rosen: I’m very proud of this book, and of Amy Rosen. This book feels like a generous gift to the people who love Toronto and the many great restaurants it has. Her sophomore book, Toronto Eats, is now out as well. Super Food Family Classics, by Jamie Oliver: Jamie Oliver (with the help of his team) has written a lot of cookbooks over the years, but I particularly like this one (though I should warn it has zero cultural nuance). It’s a go-to for weeknight dinners. Blood, Bones and Butter: The Inadvertent Education of Reluctant Chef, by Gabrielle Hamilton: This one of the best narratives on food I’ve ever read. You really have to marvel at how she managed to have the life she did and still write so well. The Fortune Cookie Chronicles: Adventures in the World of Chinese Food, by Jennifer 8. Lee (yes, that is an 8): What started out as a research project into the origin of fortune cookies turned into an international deep dive into the world of Chinese food (on a New York Times budget too). It’s simply fascinating and explains so much. Kitchen Confidential, by Anthony Bourdain: I love him and his crazy ways. Published at a time when all the rest of the world was tuning into the clean cut chefs on Food Network, Bourdain had the guts to write one of the biggest restaurant industry tell-alls ever. My Life in France, by Julia Child with Alex Prud’homme: I’ll admit it. I read this book only after watching the movie, but now understand just how crazy and wonderful this woman must’ve been. Medium Raw: A Bloody Valentine to the World of Food and the People Who Cook, by Anthony Bourdain: This is a follow up to Kitchen Confidential, and while not as shocking, it’s still such a refreshing take on the food industry. The Flavor Thesaurus: A Compendium of Pairings, Recipes and Ideas for the Creative Cook, by Niki Segnit: A cherished gift from my friend Tessa, this is one of the best tools a food blogger can have in their arsenal. This book helps you find so many more words to replace “delicious”, sorted by type of food in a fun and intuitive way. It will change the way you think about flavour. Talking with My Mouth Full: My Life as a Professional Eater, by Gail Simmons: Gail is not only a judge on one of my favourite shows (Top Chef), but her homegrown Toronto spirit shines so brightly in her writing. And for anyone who’s ever wondered how she ended up in the place she is in, read this to find out. The 4-Hour Chef: The Simple Path to Cooking Like a Pro, Learning Any Skill & Living the Good Life, by Tim Ferris: I didn’t think someone could write about food in such an efficient and practical way. It’s not the most glamourous book, but for anyone who likes to “crush it” for anything, what a great book to use to learn about cooking from a life hack master. 1,000 Foods to East Before You Die: A Food Lover’s Life List, by Mimi Sheraton: You can make your own food bucket list, or you can just use this one. While a bit outdated now, it’s still a great read. Benu, by Corey Lee: While technically a cookbook, no one expects you to actually recreate Chef Lee’s incredible 33-course tasting menu. It’s simply a beautiful and inspirational book, worthy of any minimalist foodie’s coffee table.